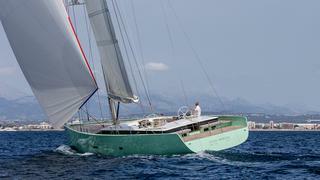 One of the most striking design features on the Brenta 80DC sailing yacht Cool Breeze, built by Michael Schmidt and designed by Brenta Design, has to be her cool green hull colour. Inspiration came from Schmidt, who loves the look and colour of vintage Vespas, revealed Brenta Design's Lorenzo Argento. This colour was perfect for the owner, Argento explained, because the owner loves classic styling – he owns a Bounty and Herreshoff-designed yacht from the 30’s. 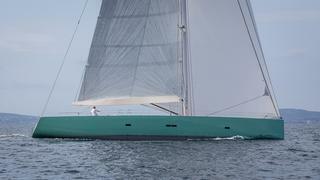 One of the most striking design features on the Brenta 80DC sailing yacht Cool Breeze, built by Michael Schmidt and designed by Brenta Design, has to be her cool green hull colour. Inspiration came from Schmidt, who loves the look and colour of vintage Vespas, revealed Brenta Design's Lorenzo Argento. This colour was perfect for the owner, Argento explained, because the owner loves classic styling – he owns a Bounty and Herreshoff-designed yacht from the 30’s. The classic styling of Cool Breeze extends to her layout, too. “We have defined three different deck levels," Argento says. "One aft, one in the middle with 300mm bulwark and one forward. These different deck levels play a very important role as it looks like the coachroof is sunken into the decks helping to reduce the visual impact. Further the vertical coachroof sides have, like in the old days, portlights which helps greatly ventilation. 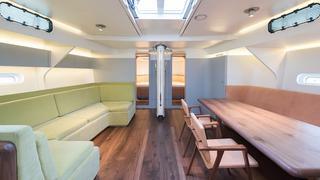 Legendary global architect Sir David Alan Chipperfield lent his hand to the interior of Brenta 80DC Cool Breeze. This is Chipperfield’s first foray into working with yachts, though he is no stranger to sailing and designed the America’s Cup building in Valencia, Spain. “He never worked on an interior boat before, but he is a sailor and he enjoys day sailing with his own B42 – which we designed by the way,” reveals Argento. “Chipperfield called for a very “safe” interior with a generous radius and a very clever use of materials and colours in true respect of the hull form and structure layout. “His interiors gently intersect with existing structural elements clearly showing the hull form and adapting the interior to her shape – the table bench in the main saloon is a good example. Don’t let her playful exterior or classic layout fool you – Cool Breeze is very much a cutting edge sailing yacht that has been built in carbon fibre to make her lighter and faster whilst being strong, durable and safe. This Brenta 80DC sailing yacht has already shown some impressive performance over the first few thousand miles, reaching 23 knots easily, Argento told us. Cool Breeze will be sailing to the Caribbean for the winter and back to the Med next year. Don’t let her playful exterior or classic layout fool you – Cool Breeze is very much a cutting edge sailing yacht that has been built in carbon fibre to make her lighter and faster whilst being strong, durable and safe. This Brenta 80DC sailing yacht has already shown some impressive performance over the first few thousand miles, reaching 23 knots easily, Argento told us. 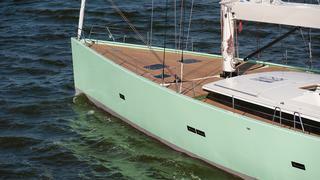 Cool Breeze will be sailing to the Caribbean for the winter and back to the Med next year.